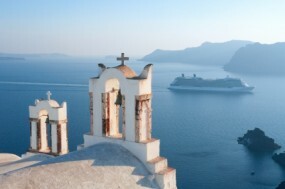 From Greece to Turkey and beyond - Imagine yourself working on a cruise ship under sunny Mediterranean skies. Thousands of people, from nations throughout the world, are living the dream right now. A hiring representative from Variety Cruises explains how she recruits and hires for her company's ships. Variety Cruises is the largest small ship cruise company in the world, and we have a fleet of 11 ships that operate around the Mediterranean and Europe to Africa, offering wonderful vacations to families, couples and like-minded travelers who prefer a quieter, less crowded ship. We have a fleet of 11 vessels. Our small ships include the MY Harmony V, the MY Harmony G, the SC Panorama, SC Panorama II, MS Galileo, MY Pegasus, and MY Variety Voyager. Our yachts comprise of the MY Obsession, MY Monte Carlo, MY Absolute King, and the SY Christiana VIII. What would the shipboard experience be like for a typical employee? Well this differs depending on the ship you work on. For the yacht crews, where you are one of only a handful of staff, you must have great attention to detail and be willing to help with anything you can on board. You will get more one on one time with guests. On the small ships you will need to possibly work harder as you have more to attend to and you will not necessarily get to speak to guests, but you can expect more team work. We need wait staff and servers frequently, as these don't really require much in the way of qualifications or experience, but we also advertise for deckhands and other hospitality staff quite often. Employment is offered either seasonally, on a temporary, casual basis, or full time. Free accommodation and meals are offered as part of your employment. Make sure that you have read up on our company and know the vessels. Have an understanding of the position you are interviewing for, and come well dressed, and on time. Show us your positivity, service skills, and friendly, outgoing nature, and you will do well. There are lots of these, but the most common I think is that people want to have a working holiday where they work for a few hours and then have the rest of time off to sight see and relax. This is very far from the truth and you could end up working 12 hours a day or more, depending on the size of the vessel and how many staff members are on board. Whatever shifts you might have, you are basically on call to work 24 hours a day, especially if there happens to be an emergency, so it is not a holiday at all. Another one I hear often is that people will get paid a huge salary and come off the cruise rich. The wages are competitive and market related, but they will definitely not make you rich. Maybe you will spend less money being on board and working such long hours, so that is true, but you don't earn an abnormally high wage.